A premise of fun combined with fascinating history of Ireland. We learn through a small amount of efficient dialogue that Jimmy spent that time in the United States – in search for a better life, but the Great Depression hit and he returned home. We continue to learn through efficient and tantalizing dialogue that Jimmy is a local hero. Not just because he travelled to the States, but because he built Jimmy's hall. A community hall, on his land, started with his money, used as a place to dance, to paint, to read and to learn. A group of people too young to know Jimmy personally, but know the stories about him, yearn for a place like that. A place to go, have something to do, and have fun. Jimmy is very apprehensive, but is still drawn to this hall, that is now completely boarded up and fallen into disrepair. Something that seems so simple and innocent, turns out to not be that when further history of Ireland is revealed. The Catholic Church had control of all education and deemed the hall as offering classes, therefore banned by the church. Jimmy's Hall is the fight for freedom of personal expression against religious persecution and it was as enlightening as it was terrifying. It combined a Footloose-like quality of “we just want to dance” with a much scarier, more violent reality of Catholicism vs. Communism. In addition to the economic woes of the United States, the war woes of Ireland, Russia was going through its own communist uprising. The world history of the time formed a fascinating background for this story of a socialist activist, a conservative priest, and a group of people who just want to dance and have fun. 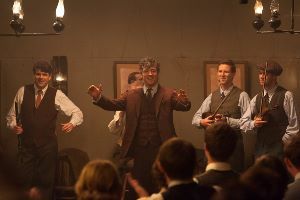 Jimmy's Hall is interesting, and even though the light-hearted premise belies the severity of what's at stake, director Ken Loach did combine the two with the beauty of Ireland and ideas of true love. It's sometimes slow and sometimes dry but it's also a story that needs to be told. Philomena (2013) - Masterfully written, beautifully portrayed story that is better than just a human interest story. The Sapphires (2012) - A fascinating look at a singing group in the year the world changed. Calvary (2014) - The dark past of the Catholic Church turned into a darkly comedic tale of morality.